We can be incensed by North Korean bellicosity, but we shouldn’t be surprised. North Korea’s political behavior often seems as inscrutable as it is hostile. From its incessant threats and its December hack into Sony Entertainment, to its recent offer to stop nuclear tests, North Korea’s actions always manage to create confusion and consternation amongst U.S. analysts and policymakers. Pyongyang’s latest round of hostility has sparked a predictable debate over how to best respond, with some calling for more sanctions, others calling for more diplomatic engagement, and still others making the case for full-on regime change. But a preoccupation with the question of how to punish or manage North Korea has led us to neglect a more fundamental question: What causes North Korea to be so erratic, hostile and bizarre, so frequently? Let’s first consider a point that is frequently – and unfortunately – ignored: North Korea’s actions are not irrational. Notwithstanding a popular perception to the contrary, behind all the strangeness and bellicosity of the regime, there is a logic that underpins its behavior. And the first step in understanding this logic is appreciating North Korea’s strategic interests. The principal interest of North Korea is simply survival. In practical terms, this means the prevention of an attack, invasion or conquest by its enemies – namely, the United States and South Korea. 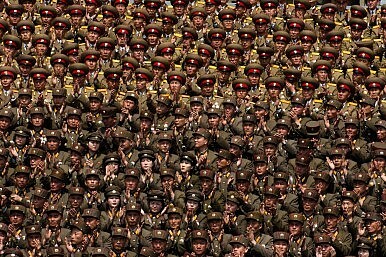 Importantly, North Korea views invasion by foreigners as a palpable threat. In December, in response to planned U.S. military drills with South Korea, the Korean Central News Agency announced that “such behavior of the U.S. imperialists is a revelation of their evermore undisguised attempt to invade the DPRK.” It continued, claiming the U.S. has a “sinister intention to egg the South Korean puppet forces on to military confrontation and war.” These kinds of accusations are thrown around in every direction in North Korea. But not out of mere paranoia. Pointing to perceived threats from abroad helps to ensure internal cohesion and is a favorite tool of the Kim regime. In fact, doing so is part of North Korea’s political DNA. Beginning in the 1950’s Kim Il-sung, the grandfather of Kim Jong-un, promoted a political philosophy, known as juche, that emphasizes the importance of self reliance, and cautions against relations with foreign states. The philosophy, which emerged from the memory of Korea’s colonial dependence on Japan, still haunts the North Korean psyche and continues to influence Pyongyang’s unwillingness to cooperate with foreigners. But if North Korea so values “self reliance” and political isolation, why does it constantly act in erratic ways that are sure to attract international attention? In short, Pyongyang knows that bellicosity pays. Tim Sullivan has pointed out that over the last twenty years, Pyongyang’s cycle of threats has resulted in billions of dollars worth of concessions from the international community. For instance, in the early 1990’s Pyongyang used the threat of its nuclear weapons program to extract promises of $5 billion in fuel and two nuclear reactors. Similarly, in 2006, Pyongyang launched its first nuclear weapon, which prompted a deal that included food aid from the West and political concessions from South Korea. Today, North Korea’s hostility is contrived with two objectives in mind: first, to get the U.S. to cancel its war drills with South Korea, and second, to pressure China into maintaining its old policy of looking the other way as Pyongyang violates international sanctions. This is not to say that North Korea doesn’t act out for other reasons. Take, for example, its recent hack of Sony Entertainment and its threat of “9/11 style attacks” against the U.S. following the release of the movie, The Interview. Did Pyongyang not realize the movie, with its fictitious portrayal of Kim Jong-un’s death, was a comedy? Well, no. As Korean historian Bruce Cumings has noted, the supreme leader is viewed as a sort of demi-god father, rather than simply a national leader. In fact, the literal translation of the widely espoused term, uroro patta (to hold Kim in esteem,) is to look up and receive, and is used in the sense of receiving Christ or esteeming one’s father. When Sony Entertainment released The Interview, North Koreans didn’t laugh. They viewed the movie as if it was about the literal murder of their father, and they responded accordingly. What this all suggests is that North Korea’s actions are far from unpredictable. George Kennan famously noted that the personality of Soviet power was a product of ideology and circumstances – the same can be said of North Korea. We are right to be incensed by the bellicose conduct of Pyongyang, but we shouldn’t be surprised. Will the Party Congress lead to the announcement of big reform?